This week I wanted to share some videos by pianist Oscar Peterson as a source of inspiration. Peterson released over 200 recordings, won eight Grammy Awards, and is considered one of the greatest jazz pianists of all time. In the following video Peterson gives a piano lesson, where he exemplifies each style of jazz piano. He goes through styles such as stride, and shows the framework behind famous pianists such as Nat Cole and George Shearing. In addition to playing each style of jazz piano, Peterson is able to articulate what exactly goes into each style to make it sound special. This video is especially eye-opening, as Oscar Peterson is such a unique voice in jazz - yet he can pinpoint the style, sound, and framework behind all the greats. In this way, he showcases how much research and work goes into every phrase - everything he plays has care and meaning. 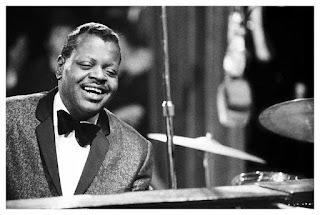 What's also special about Oscar Peterson is his jubilance with everything he plays - in fact he even once quoted: "I believe in using the entire piano as a single instrument capable of expressing every possible musical idea." To learn more about Oscar Peterson and his career, listen to the NPR Jazz Profile, "Oscar Peterson: Piano Master." Even the masters were once students - and it is inspiring to know that they never stop learning! Because, even when you conquer one musical idea, there are still infinite possibilities for the imagination.